When the skin comes in contact with a substance and causes the skin to break out in a red, itchy rash, it is called contact dermatitis. These substances are termed as irritants or allergens. It is very uncomfortable, but not contagious or life-threatening. It is usually seen as dermatitis on hands, but can be seen on any skin part which was exposed. Doctors can diagnose it by taking the exposure history, physical examination and skin patch testing. The treatment regime involves administration of anti-pruritic drugs, topical corticosteroids and avoiding contact with irritants. There is infection in the skin, which can be possible if there is fever and pus coming from blisters. What Are the Causes & Types of Contact Dermatitis? The 2 main types of contact dermatitis and their causes are discussed below. This is the most common type of dermatitis and accounts for up to 80% of the cases in the United States. It is non-allergic and inflammatory and occurs when the irritant comes directly in contact with the skin. It can cause irritation after a single exposure or after repeated exposures. It is most frequently seen on the hands and forearms, but can occur on other parts of the body as well. People who work in areas in which there is constant exposure to irritants or allergens like food preparations, dish washing, hair styling, cosmetology, cleaners, metal workers and construction workers are more prone to contact dermatitis. This type is also known as Occupational Contact Dermatitis. This type of contact dermatitis occurs when a substance you are allergic to comes in to contact with part of the body and triggers an allergic reaction. It can be localized or it can also be caused by foods that are eaten. 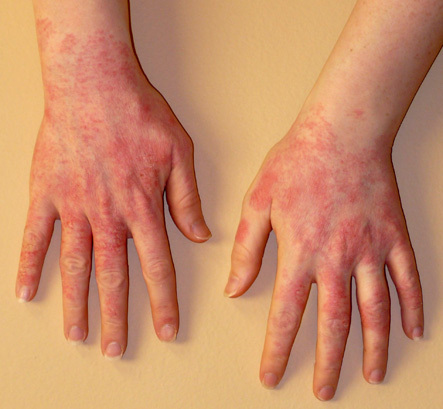 Allergic contact dermatitis is seen as frequently in children as in adults. What Are the Treatments for Contact Dermatitis? The first line of treatment involves washing the part of skin with water. It needs to be washed thoroughly to remove all traces of the irritant or allergen causing the dermatitis. Exposure to the irritant or allergen should be avoided and sometimes nothing should be done on the affected area. One of the most effective measures of preventing and treating contact dermatitis is to use moisturizers or emollients. They keep the skin moist, help in skin repair and prevent further inflammation. OTC products containing corticosteroid skin creams and ointments helps in reducing inflammation. Doctors also prescribe creams containing drugs called as tacrolimus or pimecrolimus for topical application. Sometimes wet dressings, antipruritic or drying lotions are recommended to reduce other symptoms. Corticosteroid pills can be prescribed in severe cases, starting with high dose, tapered in duration of 12 days. Avoid contact with irritants and allergens. Once they are identified, such substance should be avoided definitely. Ensure that the part of the body which has come in contact with the substance is washed thoroughly with water and mild, fragrance free soap to remove the substance. Clothes should also be washed to remove any trace of the substance. When working with chemicals or other harsh substances which can cause irritation or allergy, protective clothing like masks, goggles and gloves should be worn. Clothes which have metal parts should be covered with iron patches so that the zipper, clasp or button does not come in contact with the skin. Some OTC products like barrier gels or creams are available which form a protective layer on the skin and can prevent or lessen the reaction on the skin. Using moisturizer helps in keeping the skin moist and supple and also helps in restoring the outermost layer of the skin. Pets can usually spread allergens from plants to people, hence care should be taken.